Cuckooboo can be found in boutiques worldwide. She is giving away an Alice and Mad Hatter ponytail set. Contest ends on April 17, 2010 and is open internationally. Please email us of you cannot comment below. Thanks and Good Luck! What cute hair ties. Please enter me. +2 hearted, my username is amarantos. +3 Following both, and I voted for Ciera. +3 I’m a fan of both! These are really cute ponytail holders. Love them! +2 My fav items are the ‘What’s yout age?’ ponytail holders. +3 follow us on twitter @CucKooBoo and @FireIcePhotos! +3 become a fan of Cuckooboo and Fire and Ice on Facebook! I’d love to enter! Thanks! 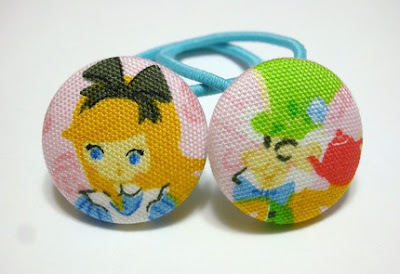 +2 My fav item would have to be the “Green Apple Ponytail Holders”! I love green apples!